This is my mother's recipe for chickpeas. It is wonderfully tart and hot. My mother's family, still living in the narrow lanes of an Old Delhi built in the 17th century, tended to eat very spicy foods. My father's side of the family, which had moved in the 1920s into a more westernized section of town built outside the Old City walls, ate a calmer, less fiery cuisine. As a child, I loved both styles of food, but because my father and his very "proper" ways smacked of Establishment, I would often sneak off with my mother to eat spicy bazaar food served on leaves of dubious cleanliness in the narrow lanes of Old Delhi. This chickpea dish is still sold in Delhi's bazaars by hawking vendors. The chickpeas used are the dried variety that have to be soaked overnight and then boiled until tender. The paprika that I have used is a substitute for the Kashmiri red pepper, which gives a red color — but no heat — to the dishes in which it is used. 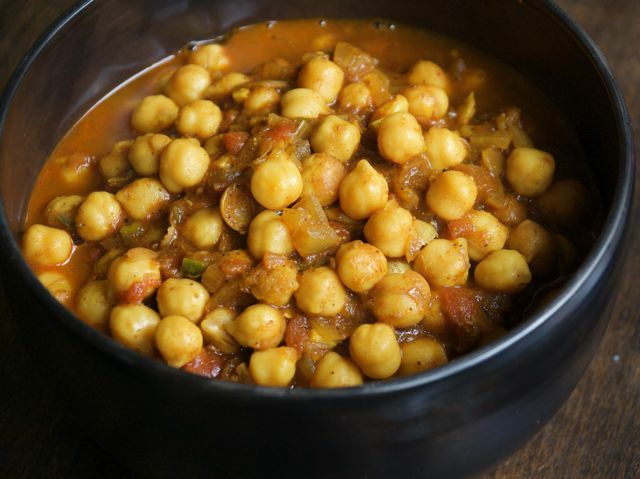 These spicy chickpeas can easily be made up to two days ahead of time. In fact, their flavor improves if they are left, refrigerated, for 24 hours. Heat the oil in a wide pot over a medium flame. When hot, put in the minced onions and garlic. Stir and fry until the mixture is a rich medium-brown shade. Turn the heat to medium-low and add the coriander, cumin (not the roasted cumin), cayenne, and turmeric. Stir for a few seconds. Now put in the finely chopped tomatoes. Stir and fry until the tomatoes are well amalgamated with the spice mixture and brown lightly. Add the drained chickpeas and 1 cup water. Stir. Add the ground roasted cumin, amchoor, paprika, garam masala, salt, and lemon juice. Stir again. Cover, turn the heat to low, and simmer for 10 minutes. Remove the cover and add the minced green chile and grated ginger. Stir and cook, uncovered, for another 30 seconds. Made from sour, unripe mangoes, amchoor comes in dried slices and powder. Amchoor gives foods a slightly sweet sourness. My recipe calls for only ground (i.e., powdered) amchoor, available in Indian grocery stores. Garam masala is an aromatic mixture of spices, such as cardamom, cloves, and cinnamon, which are supposed to "heat" the body. Look for this spice in the spice or bulk aisle.